How many times can you hear the same delays and filters and reverbs over and … over … again? The developers at DaevlMakr promise a more “organic” quality by employing unusual combinations of techniques and adding a little chance to the flow in their Daevl.Plugs suite. I’ve been meaning to talk about their work for some time (and, of course, they’re evidently CDM readers). I’m adding them to some projects now, but in the meantime, here’s an initial preview. And I’ve gotten some additional feedback from our recent contributor addition, Liz Knight aka Quantazelle, who has met the developers and been toying with the sounds. daevl.cerberus: “Three delays in a feedback network, with distortion via self frequency modulation plus time-shifting on each channel.” Think multi-tap/delay feedback with a timbral twist. daevl.cubedriver: Bitcrusher + pitch shifter + stereo delay = swirling digital mayhem. You’ll know the effect when you hear it, but it’s still not something you’ll find included in a Pro Tools bundle. daevl.hilbertspace: “Three Hilbert-Transform ring modulators in a dual mono delay network.” Glitchy, digital ring mod. daevl.noise: “Three channels of pitched noise and single channel of filtered white noise”, enveloped by the source. Lovely, sculpted noise, which I imagine you could mix in either liberally or conservatively and use any number of ways. daevl.threep: “Networked pitch shifters in motion, with random pitch sweeps every n seconds, specified by portamento time.” Crazy sweeping things. Can’t really describe it more than that. daevl.triad: “Three pitch class filters with selectable Q, cross-channel frequency modulation, overdriven distortion on each channel, followed on the composite out by a smoothly randomizing 5 band EQ peak synchronized to the source signal.” In other words, it either does subtler random EQ effects or, if you prefer, eats your tracks alive. 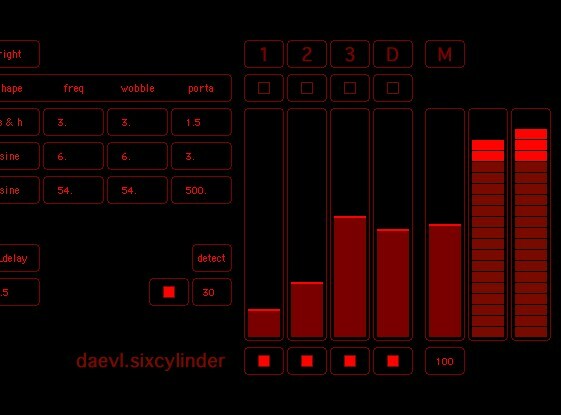 daevl.triphase: Phase delays with unusual routing options and audio-rate modulation for distortion. 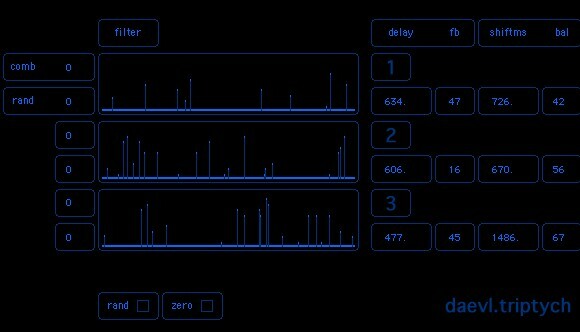 daevl.triptych: Three parallel graphic multiband filters with time-shifting and feedback — arguably the most useful here, and definitely not what you normally find in your plug-in kit. My favorites are the Cubedriver—it bitcrushes and pitch-shifts audio based on where it is in the stereo delay loop. It really gives the audio a kind of 8-bit edge, but more controlled. Hilbertspace is also nice—it combines ring modulation with delay and adds a crunchy metallic overtone to the audio. Although FL Studio isn’t listed in the compatible applications, I got them to work just fine within it. Sometimes the variables are labeled enigmatically and it’s not clear what a modification does, and you just have to pull down every setting and sort of reverse engineer it a bit to figure out what’s going on. Most of them have easily discernible names (r_dly right delay, r_fbright feedback etc), though. I sort of wish there were more presets so that it’s easier to figure out the kind of scope of transformation you can achieve with each plugin. The demo versions feature a burst of pink noise every minute, but registering them turns it off. For US$36 bucks, it’s pretty cheap to do so and they are neat little toys with a lot of flexibility and some nice audio mangling ability. I think perhaps they should provide an option to turn the pink noise burst back on. If you use them, as well, let us know what you think. They’ve also created The 5 Way Path, a little invitation to use a single, 5-sample loop pack to create songs — the idea being you’ll have to overcome that limitation to see just how much variety is possible. There’s already a great lineup of tracks. Developed a plug-in? Got one you love? Always feel free to send it.